February volunteer of the month! 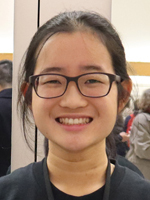 Congratulations to Jackie Liu, our February 2019 volunteer of the month! Jackie is recognized for her exceptional service at our A Celebration of Robbie Burns Buffet and Concert, at many past community events and concerts and in our Adapted Art classes.